Myanmar, officially the Republic of the Union of Myanmar (ပြည်ထောင် စု သမ္မတ မြန်မာနိုင်ငံတော်) and also known as Burma, is a sovereign state in South East Asia bordered by Bangladesh, India, China, Laos and Thailand. About one third of Myanmar’s total perimeter of 5,876 km, forms an uninterrupted coastline of 1,930 km along the Bay of Bengal and the Andaman Sea. The country’s 2014 census revealed a much lower population than expected, with 51 million people recorded. Myanmar is 676,578 km2 in size. 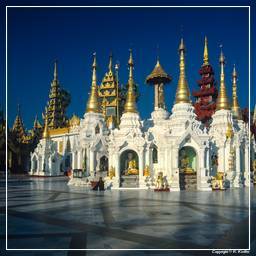 Its capital city is Naypyidaw and its largest city is Yangon (Rangoon). Early civilisations in Myanmar included the Tibeto-Burman-speaking Pyu city-states in Upper Burma and the Mon kingdoms in Lower Burma. In the 9th century, the Bamar people entered the upper Irrawaddy valley and, following the establishment of the Pagan Kingdom in the 1050s, the Burmese language, culture and Theravada Buddhism slowly became dominant in the country. The Pagan Kingdom fell due to the Mongol invasions and several warring states emerged. In the 16th century, reunified by the Taungoo Dynasty, the country was for a brief period the largest empire in the history of Mainland Southeast Asia. The early 19th century Konbaung Dynasty ruled over an area that included modern Myanmar and briefly controlled Manipur and Assam as well. The British conquered Myanmar after three Anglo-Burmese Wars in the 19th century and the country became a British colony. Myanmar became an independent nation in 1948, initially as a democratic nation and then, following a coup d’état in 1962, a military dictatorship. For most of its independent years, the country has been engrossed in rampant ethnic strife and Burma’s myriad ethnic groups have been involved in one of the world’s longest-running ongoing civil wars. In 2011, the military junta was officially dissolved following a 2010 general election, and a nominally civilian government was installed. While former military leaders still wield enormous power in the country, the Burmese military have taken steps toward relinquishing control of the government. This, along with the release of Aung San Suu Kyi and political prisoners, has improved the country’s human rights record and foreign relations, and has led to the easing of trade and other economic sanctions.